I was quite surprised to learn that one of the most popular searches that led to Square Pennies was “Square Pennies Steak.” Since I don’t have a post titled that, I began to wonder what people were searching for. Is there such a thing as Square Pennies Steak that I don’t know about? Or maybe readers are remembering something about steak that I’d posted. 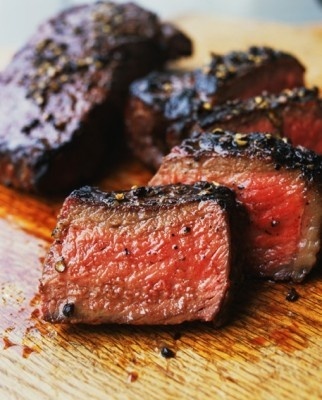 So here’s a list of posts that are about steak. Beef prices are set to be lower soon due to the drought–ranchers slaughtering cattle instead of trying afford their feed. So maybe it’s a good time to dust off a few of these. If you find a good deal on steaks and/or other cuts of meat this fall, put some in the freezer. Prices will go up after this supply is gone. 1. This might be the steak tip most people are looking for. This seems to be the secret way to make steaks like restaurants do. You sprinkle a little sugar on each side of the steak and grill it until it’s seared. Then you put the steaks in the oven to finish cooking. It’s also a great way to prepare steaks for a lot of people since you can keep them in the oven until serving time. 2. This method uses salt to pre-treat the steaks. It’s supposed to make a steak taste like a higher grade of steak. So you can save some money buying lower grade steaks. 3. If all that salt and sugar doesn’t sound good to you, consider making quick grilled strips of flank steak with jerk seasoning. So yummy with avocado salsa as a side. 4. You can make a simple marinade of 1/2 balsamic vinegar and 1/2 whiskey. Marinate for 30 minutes and grill. You don’t need much of the marinade, so start small when you make it. Now can you part with some Jack Daniels for the steaks, is the question! I hope you find some good deals on steaks sometimes and can enjoy a good steak at home. It’s always cheaper than having a steak at a restaurant. 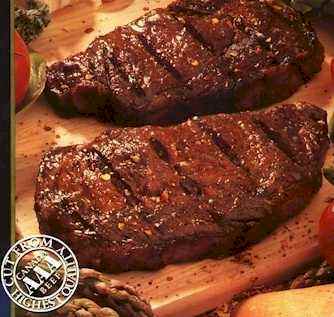 Add a salad and baked potato for the basic steak dinner. I like to add some mushrooms and broccoli. Enjoy!